For programmers, being productive means writing more code. Let’s assume it takes 10 lines (including tests of course) to finish a feature. Any time spent not writing those 10 lines isn’t getting you any closer to finishing your feature. Meetings, reddit, compiling, etc. all distract you from reaching your goal. You can’t type those 10 lines any faster, you’re already typing at 124 WPM. In order to be more productive, you would have to stop reading reddit and optimize your compile times. WakaTime can’t prevent you from reading reddit, but we can track how long you wait for your builds to finish compiling. With this information, you can identify slow compiling in your projects and take action to optimize building. Starting with Xcode, we’re adding the time you spend compiling code to your WakaTime Dashboard. 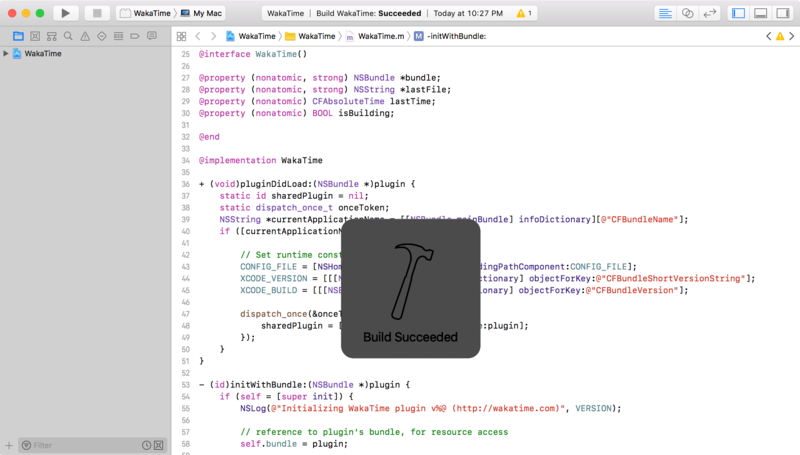 To track the time you spend compiling builds vs. writing code, install the WakaTime plugin for Xcode.